A club good is an excludable but non-rival good. See Excludable Good and Non-rival Good. Alex Tabarrok (reference below, video on right) explores how markets provide club goods such as cable TV. From http://www.mruniversity.com/node/313600, accessed 10 May 2016. Some media companies (especially in music and movie industries) run ads claiming that downloading or copying media is the same thing as stealing a CD or DVD from a store. Let’s see if this is the case. Is a DVD a rival good? Suppose someone stole a DVD from a retail outlet. Regardless of how that person values the DVD, does the movie company lose any revenue as a result of the theft? Suppose someone illegally downloaded a movie instead of purchasing it. Also suppose that person placed a high value on the movie (they valued it more than the price required to purchase it legally). Does the movie company lose any revenue as a result of the theft? Suppose someone illegally downloaded a movie instead of purchasing it. Also suppose that person placed a low value on the movie (they valued it less than the price required to purchase it legally). Does the movie company lose any revenue as a result of the theft? Why or why not? As the technology of home movie entertainment has changed from tapes and discs to digital files, home viewing of movies has changed from rival to non-rival. Assuming the law is obeyed, as the technology of home movie entertainment has changed from tapes and discs to digital files, home viewing of movies has changed from excludable to non-excludable. Public Goods and Commons Problems (core topic) in Economic Analysis and Atlas102 Economic Analysis. 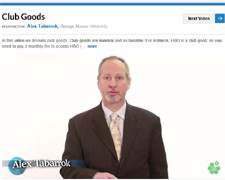 Alex Tabarrok, Club Goods (5-minute video), Marginal Revolution University, at http://www.mruniversity.com/courses/principles-economics-microeconomics/club-goods-examples, accessed 10 May 2016. Page created by: Ian Clark, last modified 109 May 2016. 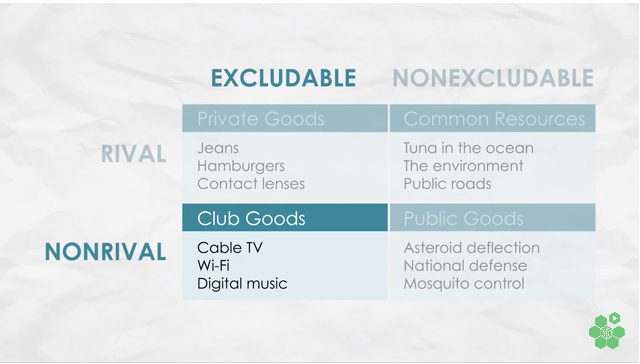 Image: Alex Tabarrok, Minute 0:15 of Club Goods (5-minute video), Marginal Revolution University, at http://www.mruniversity.com/courses/principles-economics-microeconomics/club-goods-examples, accessed 10 May 2016.